I remember getting this for my C64 back in the day and playing endlessly. I never had it on my original master system as I was not aware it was out there at the time. However when getting back into the master system this was one of the first games I picked up - and I was not disappointed. This is one of the all time great games from the bitmap brothers who in the early 90s/late 80s produced a number of hits with a unique graphical style - Gods & Chaos Engine were two other Bitmap games that ended up being ported to the mega drive. Alot of thought was put into this game to create a superb atmosphere. The C64 version game in a huge over sized card board box (do you remember those?) which contained a history of speedball booklet telling you the back story of the sport (it had to go underground at one point) in addition to providing detail on the history and strength of each team. Set in the future - normally a terrible start for a sports game, but Speedball bucks the trend by keeping it relatively simple (you only have to use 1 button (throw, catch, tackle) and the d-pad). The game is split into 2 halves with the idea being to score more points than you opponent. Points can be amassed by throwing the ball into your opponents goal (10), knocking out one of his players (10), lighting up your teams 5 stars on the side of the arena (2 points per star plus an additional 10 points if all stars are lit up) or hitting the dome in front of either goal (2 points). Games can be very high scoring if you know what you are doing and your opponent doesn't, or very tight if you are both of a similar skill. Pretty much the better player will win, which is always a good sign. There are a good variety of modes from cup (easiest to win) to league (a full two season across division 1 and 2) and knockout (I have never won this mode so let me know what happens if you are good enough to beat it!). There is also a 2 player mode from which a lot of fun can be derived if you have a friend (or heck, even a stranger will do) to play with. In-between games you can use money earned from your victory to boost your players abilities, or to buy a new player in on the market. This adds a lot of depth to both the 1 and 2 player modes as the player stats make a huge difference. Tip - make sure you invest heavily in attack, speed, defence and power! I can remember my brother making me close my eyes whilst he made his selection as he had read the above tip in a magazine - it took me months to work out during which time I was beaten soundly time and again. However it is nice to see that the attributes are more than just lip service; matches can be won or lost off the back of your investment decisions. Very good - this is a big step up from the C64 version I used to play on, and the graphics are similar to the megadrive version. 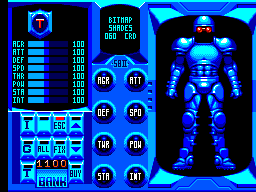 The trademark metallic tinge within all bitmap games is ever present. There are some nice touches like your players celebrating when you score. There is quite a bit of slowdown when things get hectic on-screen, but seeing as this effects both team equally no one is at a disadvantage. The screen scrolls very smoothly and the players are pretty detailed. Whilst the two teams are always red and green (which was a killer on my old black and white TV back in the day) a lot of thought has gone into the team names (Supernashwan, fatal justice, violent desire etc) and the presentation is 1st class throughout, really creating a unidque feel to this game. The sound effects are all pretty good, from the players thumping each other, to the sirens and cheers when you score, to the sirens when the robot doctors have to come on the field to drag off knocked out players! 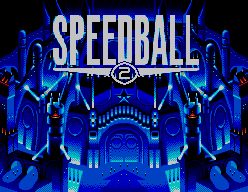 The music in Speedball per se is good, but the master system rendition does suffer some what in comparison with other versions (as the theme music has a bit of bass). Still, there is nothing here that grates and you will definitely want to keep the sound on. Many a game has risen and fallen on this. 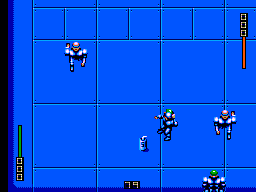 Luckily Speedball 2 gets this exactly right and spot on with very tight controls. Players respond instantly to the input commands which is fortunate because as you go through the game and improve your players it can be played at a real pace. Controls are very simple (d-pad and button 1) so this is a very easy game to learn. Insane!! The 1 player game will have you coming back time and time again. There is always another league or cup to be won, a team to improve on, options to play around with (or in my case the Knock Out cup to try and win after all these years!). This is a fantastic conversion of a fantastic game - my brother and I played this again recently when I saw him! Graphically fantastic with superb presentation - this is a game that will appeal to both sports fans and gamers. I cannot recommend this highly enough. Furthermore you can pick it up off ebay very cheaply so what are you waiting for? Definitely one to add to your collection if you do not already own it. Finally,as a testament to the quality of this game, it was re-released on Xbox live (although at the time of writing it was no longer available).